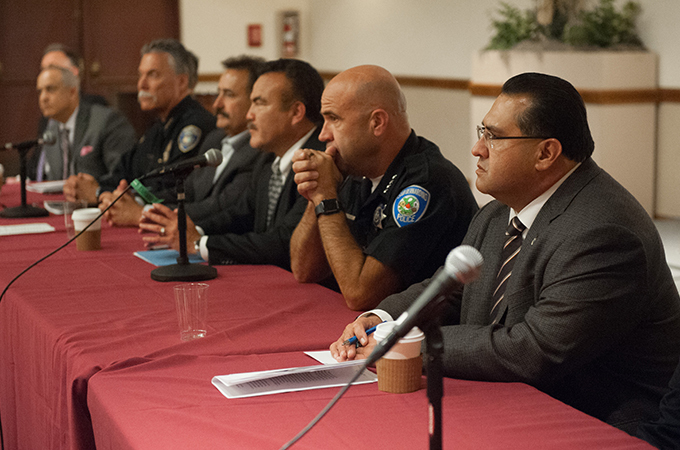 On October 26, members of the University and Redlands and local communities gathered for the second annual County, School, and Campus Safety and Security Symposium to learn about the challenges that regional schools are facing. The symposium was sponsored by the U of R School of Education and Center for Educational Justice in partnership with the Riverside County School Boards Association. Police chiefs, county supervisors, school board members, and other county personnel spoke on panels and touched on subjects of mental health, community policing, and access to resources. The first panel, moderated by Redlands Police Sergeant Daniel Marmolejo, tackled questions of safety and security in K–16 settings; the second, moderated by Professor of Education Anne Blankenship Knox, focused on public safety concerns and community issues; the third, moderated by Dean of the U of R School of Education Andrew Wall, addressed how to deal with active incidents and trauma on school grounds. —Paul Jessup ’78 ‘83, deputy assistant superintendent for Riverside County Schools. "Counseling teams in alternative programs, such as the STARS (Success Team for At-Risk Students) and HEART (Help, Empower, and Advocate Resilience through Therapy), are working to assist staff and students with mental health care."